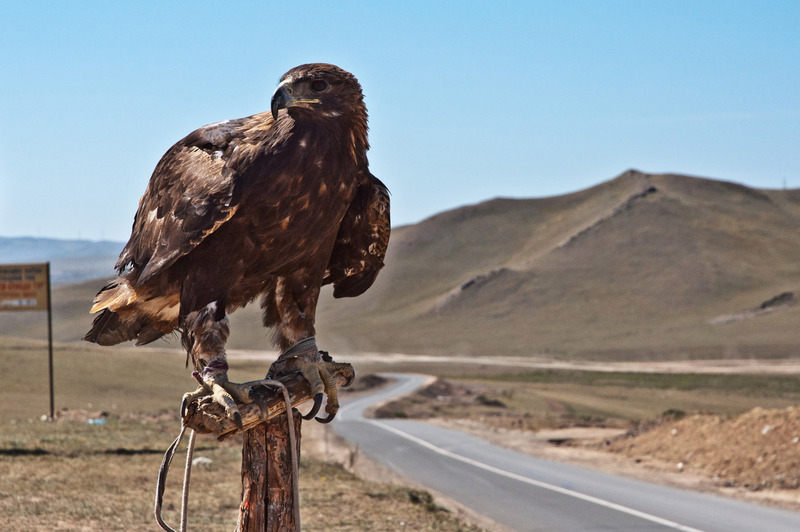 Mongolia is a country not only known for its vast lowlands, wild horses and eagles tamed by locals, but also for the cult of Genghis Khan and gold. 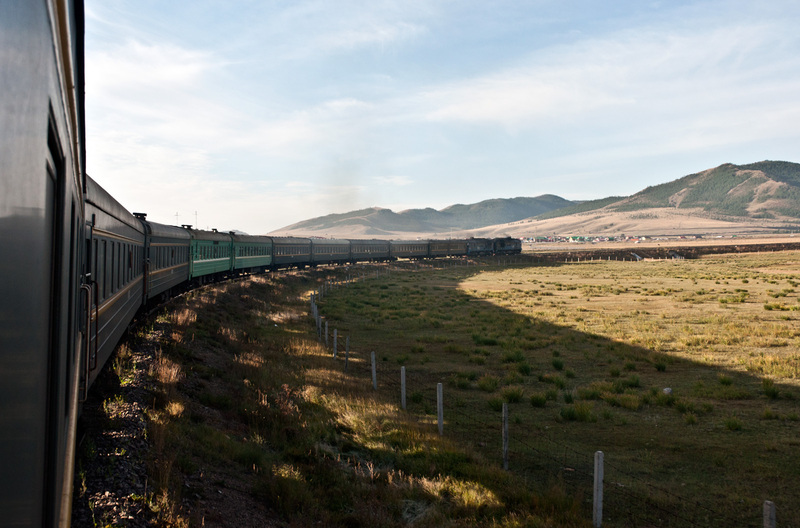 Getting to Mongolia is not that easy if you don't have a ticket already bought for the international Moscow – Beijing train, also known as the Trans-Mongolian Railway. You can buy it only a few days in advance if starting somewhere in the middle of this route. For us, there were no places left on the train which we were in, parting from Ulan-Ude, Russia. Asking a few questions here and there, we found out there was a bus going to the border in the early hours of the morning. “Good enough,” we thought. The next morning on the bus we met Nikolay. A really open and nice fellow like many of the Russians that we've met (and who weren't from the public administration). Nikolay has been our guide since our departure from the capital of the Republic of Buryatia. We were driving south and watching an action blockbuster movie in Mongolian with no subtitles. A few hours later, we arrived in Kyakhta (Ru. ÐšÑÑ…Ñ‚Ð°), a city on the Russian-Mongolian border. Nikolay helped us hail a pseudo-taxi that looked more like a ride for pimps than transportation across the border. When crossing, you may be thoroughly searched by Russian customs, as well as your belongings. Mongolian officers seemed to be rather laid back. Right after crossing, we transferred to another minibus to Sukhbaatar (Mn. Ð¡Ò¯Ñ…Ð±Ð°Ð°Ñ‚Ð°Ñ€), Mongolia, where we ended up waiting for a local train to Ulan-Bator, Mongolia. Our guide was a very social and very generous chap. We were drinking premium Mongolian vodkas (Bolor and Genghis Gold) and local beers from 12 till the evening with Nikolay telling us stories about his life and asking about our plans. What is peculiar on the one hand and interesting on the other is that when you enter a restaurant and they notice that you're a foreigner, they invite you to a special room or part of the venue that is the best looking spot. Of course, menus are all in Mongolian, but some places have photos next to the dishes. Without this, it's a Russian roulette; pick something and enjoy the spontaneous moment when waiting for your dish to come. Anyway, being a bit intoxicated, we hopped on the train to Ulan-Bator and in a few short hours were at the main train station there. We parted with Nikolay, and then came the first impression of the city. We heard that it's, for some, the ugliest capital in the world, and in some parts it resembles that image. 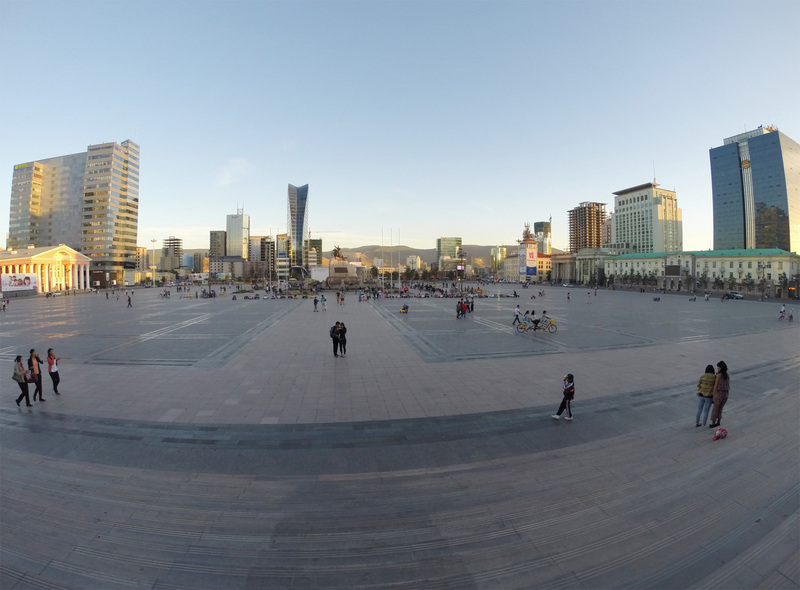 The city is developing it's centre and for the time being you can see the parliament building with… yes, a large statue of Genghis Khan, a few tall buildings and the Mongolian Stock Exchange. Slowly but steadily, changes are taking place. 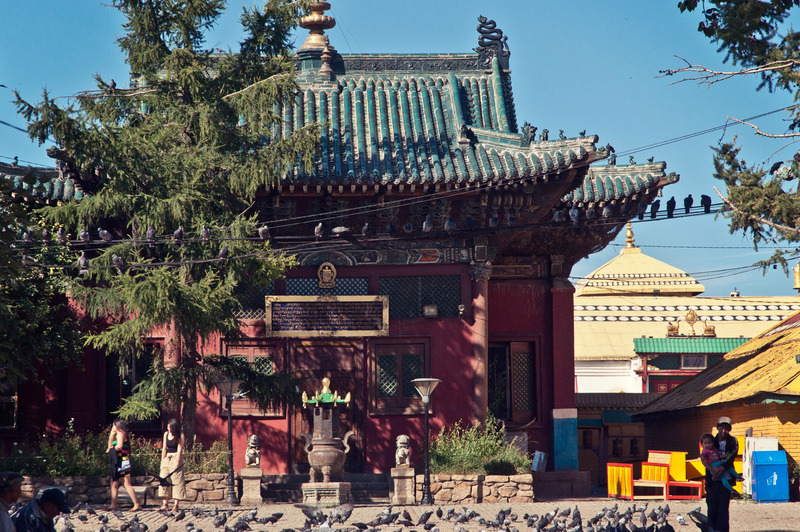 One of the places that let's you stop and contemplate for a while is Gandantegchinlen Monastery, a very important temple for Buddhists, as the 13th Dalai Lama stayed there in his residence in 1904. Mongols are polite and want to get to know you, especially children. "Hello, Hello!0 you can hear when passing by groups of them. 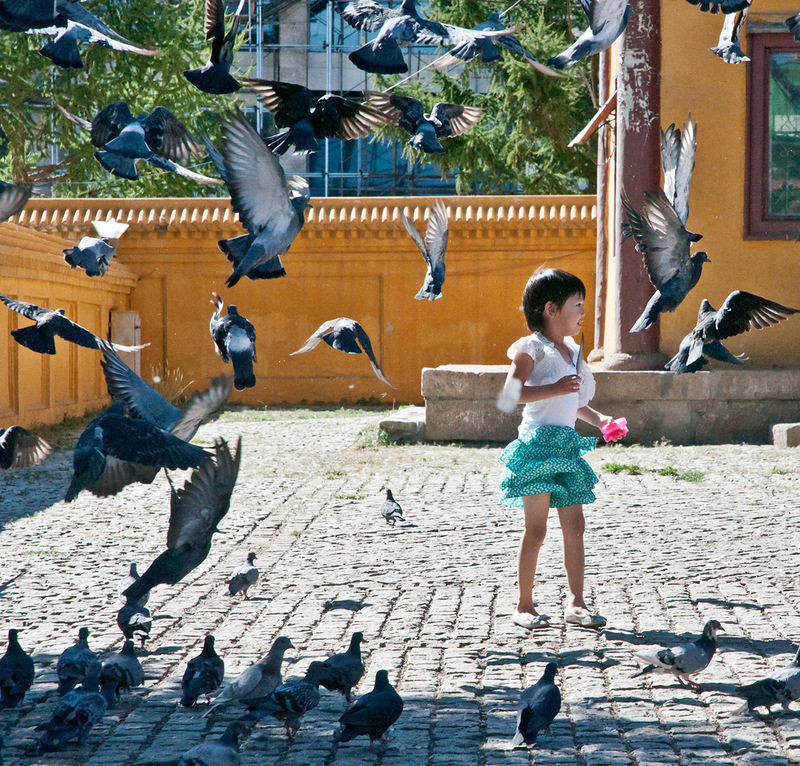 There are not many people in Mongolia who speak English and their language does not link to any Slavic or German roots. It's not easy to understand and knowing Russian doesn’t help at all apart from knowing how to decipher the letters. In Ulan-Bator, though, they want to understand you. The capital itself has little to offer in terms of typical sightseeing. When walking around, do try local specialties such as Buuz (Mn. Ð‘ÑƒÑƒÐ·)  dumplings with mutton. To be honest, most of the dishes are with meat served in huge amounts. Nikolay has explained to us that it is normal not to finish your meal because you're full. They pack it “to go” and you can finish at home. If you fancy good, local alcohol, there is plenty of it at really cheap prices (compared to European standards). 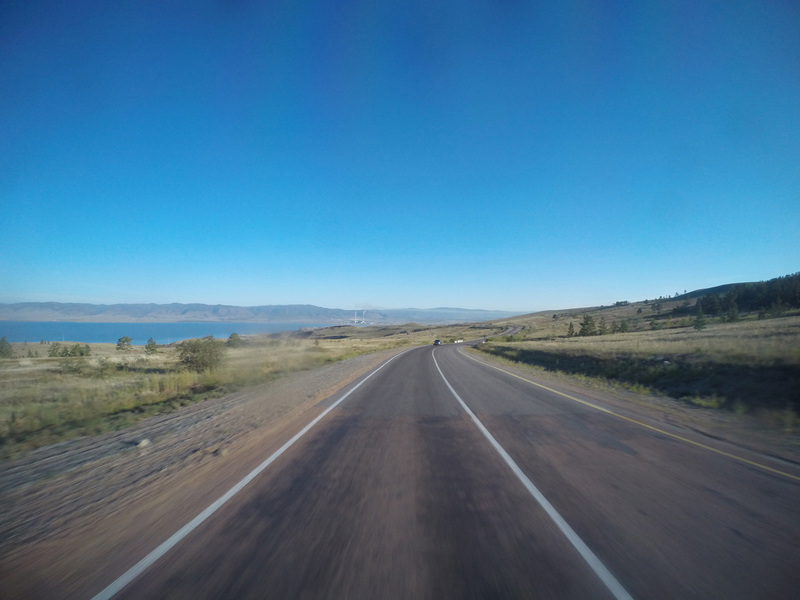 To get to know Mongolia better, we hit the steppe in a rented GAZ, a Russian on- and off-road vehicle that successfully stands the test of the steppe and Siberia's challenges. 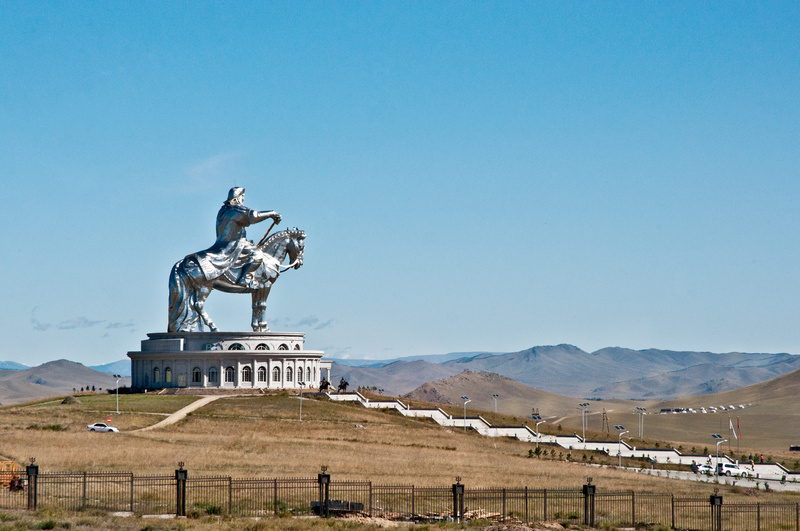 One of the things that's most impressive in Mongolia is the huge statue of Genghis Khan in the middle of nowhere. To date, it's the highest (40 m) monument of a man on a horse ever constructed. 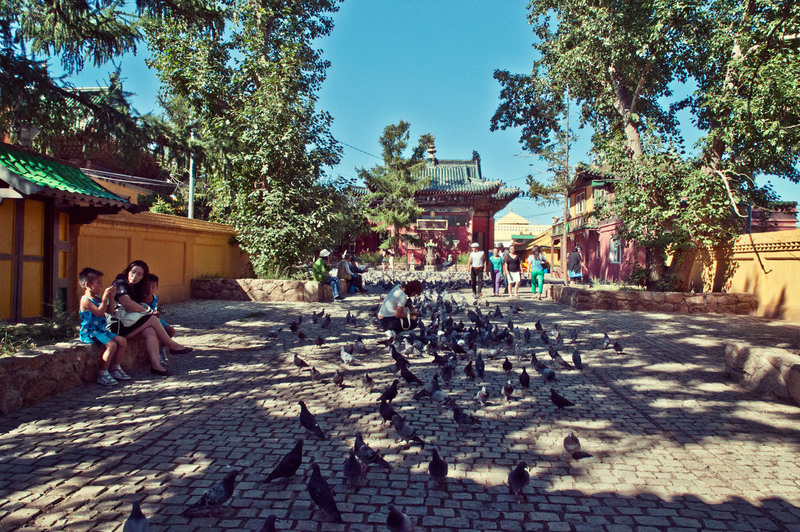 It is said to be located in the place where Genghis found a golden whip. When you travel there you will find several opportunities to hold an eagle or condor on your hand. These birds can be found throughout the Eurasian steppe, e.g. in Mongolia, Kazakhstan, China and more. Worth seeing is also the view from the Buddhist monastery in Gorkhi-Terelj National Park, where you can ride on horseback through the hills and around yurts spread across the park. “A man without a horse is like a bird without wings” says a Mongolian proverb. Having seen many wild horses, some even tamed by youngsters, a few days of tasting local cuisine, beers, and vodkas and travelling around, it was high time to continue our trans-Siberian and trans-Mongolian journey to Beijing, China. We hopped on the train into the sunset and saw the rails leading us into the nothingness of the Gobi Desert. Marcin is a typical dream fulfiller. After a long time of imagining being here and there, he decided it is high time to stop thinking and just do. From that time he started naming some of his dreams ‘projects.’ And what projects! You can find some of his most inspiring stories and photographs on his blog: http://www.marcinkonkel.com. Don’t miss out on visiting.